The enthusiastic nature lover and hunter Ole F. Bergan founded the Norwegian company Bergans of Norway in 1908. He invented a groundbreaking backpack design, patented it, and paved the way for the outdoor brand. During countless expeditions and adventures in nature, Bergans' technical equipment and functional clothing has proven itself time and again. Through its own experience and feedback from the toughest of outdoorsy types, Bergans of Norway has continued to produce innovative and award-winning products year after year. All Bergans backpacks are made of extremely durable, resistant materials, with a PU coating on the inside making the backpacks water-repellent. Many of the models also have a rain cover. Most of the large and medium-sized backpacks are available in both mens and womens models. The sustainable Oslo lifestyle collection combines timeless fashion with functional and protective qualities for outdoor use. The line offers attractive clothing not only in perfect harmony with nature, but also with first-class hardshell materials and heat-insulating layers. Oslo is designed with a strict focus on using more sustainable fabrics, materials and manufacturing. Named after capital of Norway, one of the greenest cities in the world. Welcome to Oslo! All membranes used by Bergans are "hydrophilic" and contain no pores. That is, water vapour molecules are absorped by an ultra-thin membrane on the inside of the garment. This fluid is then delived to the outer layer to evaporate. Since the membranes are non-porous, there are no pores to clog, meaning the material retains its full function even after years of intense stress. Its high-performance and durability make Bergans hardshell apparel a clear leader in the premium market. Performance meets functionality with Bergans of Norway, with its selection of high-quality sports and casual wear. With a superior choice of laidback tops and trousers, base layers and t-shirts, Bergans jackets, clothing and accessories are as suited to leisure and sporting activities as they are to relaxing around the house or meeting up with friends. The trusted brand is renowned for its range of optimised products that are ideal for all types of outdoor activities, utilising modern technical innovations to ensure they are waterproof and breathable, as well as boost comfort, no matter the weather conditions. Bergans of Norway was founded in 1908 by Norwegian Ole Bergans. The logo was conceived as a tribute to the Norwegian Civil War, when the king’s son was saved by Norwegians skiing over the mountains. It is one of the world’s most trusted brands in the outdoor and leisurewear area. Bergans products are designed with careful consideration to their environmental footprint. Every effort is made to develop high-quality products that have a long-lasting lifespan and leave as little damage to the environment as possible during production. The Bergans team strives to innovate and use materials that improve the performance of its products, while avoiding the implementation of harmful chemicals that can have a negative environmental effect. It also uses organic cotton and recycled materials in a number of products, such as recycled plastics and wool. Today, the Bergans ideology is to encourage people to experience all that the great outdoors has to offer, not just today but long into the future. Their Expedition 2020 mission is to inspire both existing generations and also future generations to make the most of the environment around them. This commitment to the environment, as well as to the well-being and satisfaction of its customers, means that Bergans is constantly researching and developing new products and materials with the aim of making higher quality, lower impact products that are suitable for sporting, leisure and everyday lives. The Bergans of Norway clothing line is ideal for all types of outdoor activities, utilising modern innovations such as membrane technology that makes the materials highly durable and long lasting, while the flexibility of the materials used means that they are extremely comfortable to wear. Their breathability also means you can keep your temperature regulated. Products are low maintenance and can be washed using regular washing powder – even after lots of washes. The designs are classic, with a timeless use of colour so that they can be used for years. 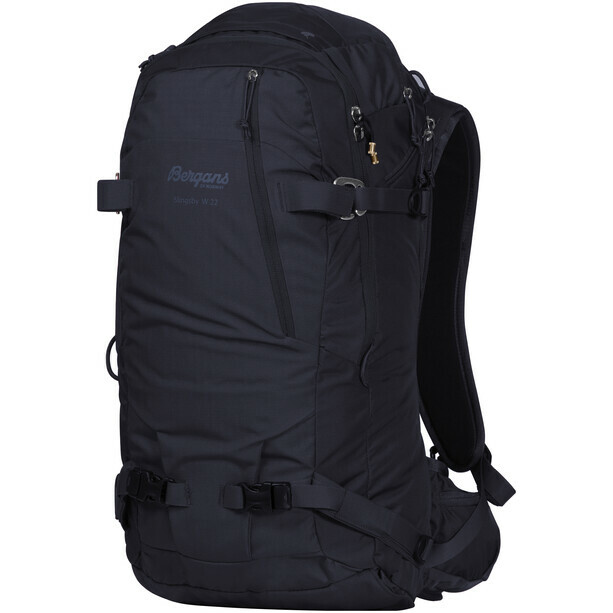 Bergans backpacks are available in many difference sizes, with a number of features to suit different activities. The day bags can be a great addition to hiking trips, while laptop bags and other smaller models that can be used for everyday use. Its larger models are good for weekend trips or longer travel and are built to withstand different terrains and weather conditions.